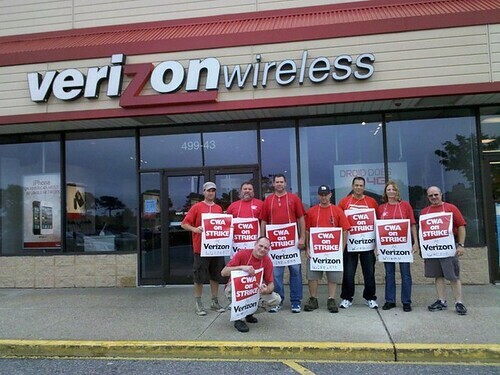 Verizon Workers Fight For Middle Class Jobs - JOIN THE PICKET LINE! Over 10,000 Workers in New York Will Join Mass Picket Lines and Rallies on Monday Morning - Join Them! This week, thousands of striking workers will join mass picket lines and rallies at over 100 Verizon work locations across New York and New Jersey to pressure the highly profitable company to back off its sweeping demands. Verizon’s demands include: gutting pension security, eliminating benefits for workers injured on the job, eliminating job security, slashing paid sick leave, and raising health care costs by up to $6,800 per worker. CWA’s contract with Verizon—covering 16,000 workers in New York (and a total of 45,000 CWA and IBEW members from Massachusetts to Virginia)—expired at midnight on Saturday, August 6th. The 70 unionized CWA Verizon Wireless technicians who maintain the New York City metro area cellular network are also on strike. Despite $22.5 billion in profits over the past four and a half years, Verizon seems intent on destroying middle-class jobs for its unionized workforce. For example, the company is reneging on promises to retired workers by seeking to force them to pay thousands of dollars for health care, and has proposed to freeze pensions for current workers and eliminate them for new hires. CEO Ivan Seidenberg, who took home $81 million in total compensation over the last four years, is guaranteed free health for life, as is his wife. Overall, Verizon paid its top five executives $258 million over the past four years. Verizon is calling for these drastic cuts for its middle-class workforce despite both increasing profits and a workforce that has shrunk by 50% over a decade in its wireline division. Moreover, at a time when workers have less job security than ever, Verizon is trying to eliminate benefits for workers who are injured on the job. Many of these employees do dangerous jobs, putting themselves at risk of permanent injury or death from a fall or other accident with no way of taking care of their families. Verizon workers from Massachusetts to Virginia will be picketing and rallying throughout the day.